The Nevada State Athletic Commission has released the official salaries for all of the contestants who competed in Saturday’s “UFC 162: Silva vs. Weidman” event. 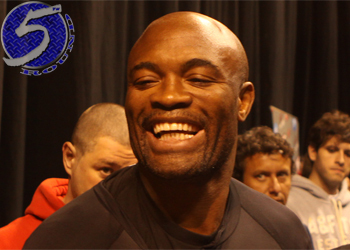 Anderson Silva’s (pictured) showboating not only cost him his UFC middleweight crown, moniker as MMA’s top pound-for-pound fighter, but he also lost out on a $200,000 win bonus. Silva’s win bonus alone would have made him the night’s second-highest earner. Nonetheless, “The Spider” still takes home a cool $600,000 for merely stepping into the Octagon. Chris Weidman, who abruptly ended Silva’s seven-year reign, scored $48,000 for his upset special. Half of his check came via win bonus. Frankie Edgar was the card’s second-top dog. The former lightweight champ made a total of $240K for beating Charles Oliveira in the co-main attraction. Please keep in mind, the numbers that get reported to the athletic commissions are only of what’s required. These figures do not include deductions for items such as licenses and taxes. Additionally, they do not contain money paid by sponsors or any bonuses from the UFC. These royalties can include Fight Night bonuses, top secret discretionary bonuses, etc., which can oftentimes represent a substantial portion of a fighter’s total income. MGM Grand Garden Arena in Las Vegas hosted Saturday’s event.